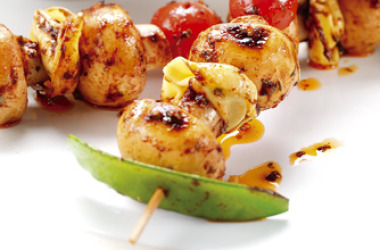 Soak skewers in cold water for 1 hr to ensure they do not burn when grilling kebabs. mange tout, mushroom, tortelloni, mushroom, tomato, mushroom, tortelloni, mushroom and mange tout. Mix the marinade ingredients together and brush the kebabs with the marinade.